This project took place in 2011. The gates were officially opened on Remembrance Sunday 2011. The Friends of Glasgow Necropolis, has been given an anonymous donation of £14k from one of its members. 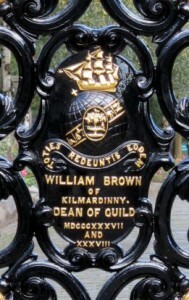 This donation is specifically for the restoration of the oldest cast iron gates in Glasgow designed by renowned architect David Hamilton in 1838 and produced by one of the foremost cast iron Foundries in Glasgow the *Edington Foundry, (also known as the Phoenix Foundry 1804-1903) for the main entrance to the the cemetery known as the Glasgow Necropolis. architectural ensemble constituting one of the most memorable compositions of townscape anywhere in the British Isles’. These Entrance gates to the Necropolis feature the symbol of the Merchants House of a Clipper Ship surmounting the Globe and the motto, ‘Toties redeuntis eodem’ – so many returning to the same place, and were originally sited at the western side of the Molindinar Ravine on the Bridge of Sighs. 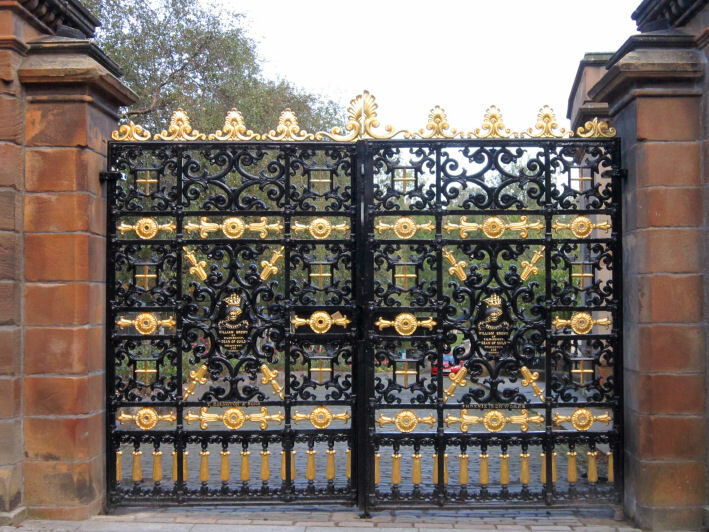 They now stand at the entrance from the Cathedral Precinct and people come from all over the world and pass through these magnificent gates to see this unsurpassed Victorian Garden Cemetery. The Friends, since their inception in 2005, have shown round thousands of people on tours. The donations they receive from their tours all go towards restoration work within the cemetery and as a registered charity the Gift Aid alone from the £14k will go towards the restoration of another Edington Foundry Gate at the Egyptian Vaults which was also designed by David Hamilton. This is a great example of people who care and are doing their best to restore this (still working cemetery) to its glory and treat it with respect. *Edington Foundry – One of Glasgow’s oldest iron foundries also known as the Phoenix Foundry. The firm was established by Thomas Edington at 52 Queen Street, and later moved to 38 and 50 Garscube Road, 1847-90, and then to 20 St. Vincent Lane. Other work by this foundry within the Glasgow Necropolis was a gate designed by John Park of Anderston to Jew’s Burying Ground, in 1832 which is now lost, and the gates to the Egyptian Vaults also designed by David Hamilton. The largest commission was for the Phoenix Park Fountain, which was gifted to Glasgow by ‘Sweetie’ Buchanan, of John Buchanan & Bros. Ltd, a local confectioner, and which stood in Phoenix Park, Cowcaddens (c. 1891). Named after the foundry which occupied the site until 1890, the park was ‘restored’ in 1959, but the fountain, which had by then become derelict, was demolished.